At our school ‘for young ladies and missionary daughters’ (I never understood that phrase – what were they implying about the morality of missionaries’ daughters? ), they used to make us eat rhubarb pie. Naturally, this was a grey mass of sour, fibrous chunks capped by an indigestible bonnet of sugar-free concrete, referred to as pastry. This was only rivalled in horror by the ‘curry’, a slurry of mince dyed green and served with dessicated coconut to add that exotic touch. At six, I added my own exotic touch by flatly refusing to eat any of it and being banished to ‘top table’ where I could be monitored by the beady eye of the head. 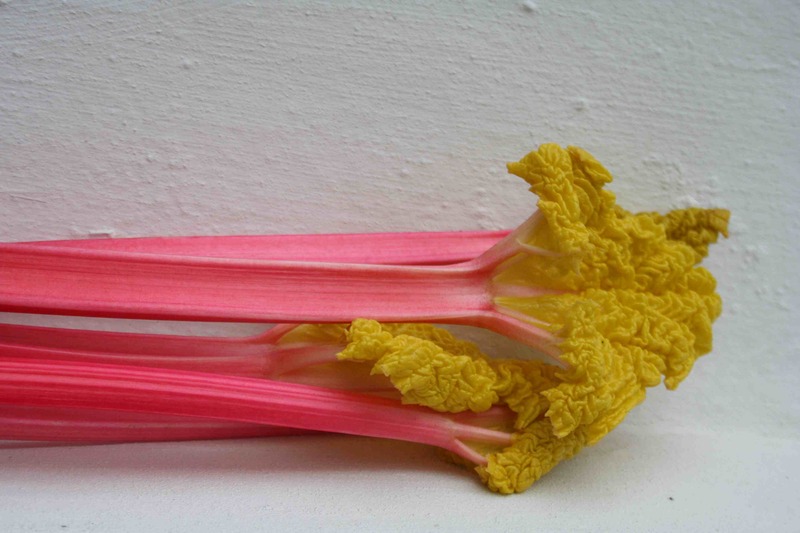 The spectre of the curry still looms large, but I think I’ve finally laid my fear of rhubarb to rest by growing my own. I bunged a terracotta pot over the top of it in February and these gorgeous alien-like shoots came up, with strangely beautiful yellow crepe leaves and stalks the most perfect delicate pink. With a dash of water, sprinkled with a little sugar and left on a low heat till they go mushy, and, obviously served with copious double cream, it is quite simply heaven in a bowl. Or at least it was. It’s time to put away the forcing pot now and leave the poor plant to recover its strength for the summer. A sad day. I tried rhubarb for the first time last week in a copomte, and I haven’t been able to keep my spoon out of the jar since! I’ve been eating it as a pancake and toast topper, but was afraid to try it in oatmeal because the flavor is very strong. I’m bookmarking this to try either this weekend or when we come back from vacation in a few weeks. There are people who have never eaten rbauhrb??? Perhaps there IS a quintessentially prairie food, I’ve never met somebody who never had rbauhrb before. It grows like a weed around here, is the first thing ripe in the spring, and tastes great in pie. In other words, everybody I know eats rbauhrb all summer long!It does NOT taste like a vegetable. It tastes like sour candy. When we were kids, we would take the raw stalks and dip it in a bowl of sugar exactly like sour candy. It has a tongue-drying tartness that is wonderful!I’m excited to try the baked oatmeal. I stew it, make it into jam, pie, and crumble but I’ve never put it in my morning porridge. Thanks for the idea!